Labour leader Jeremy Corbyn has backed a devolution deal involving the whole of Yorkshire. The plan would see some powers given to Yorkshire by central government under the control of an elected mayor. Eighteen out of 20 authorities in Yorkshire support the so-called 'One Yorkshire' model, with Sheffield and Rotherham opting for a separate South Yorkshire solution. A devolution document was submitted to the government last month. 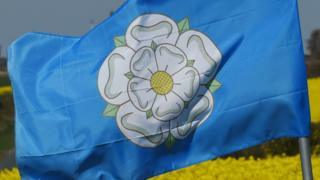 The 'One Yorkshire' plan would see a directly elected Mayor for Yorkshire to be voted in to power by 2020. The bid called on the government to devolve responsibility and funding for matters including transport budgets, franchised bus services and adult skills funding, and create a Yorkshire Combined Authority. Speaking at a meeting in Huddersfield on Saturday, Mr Corbyn said he hoped all the councils were "working together" on the deal. "There is I think a growing consensus of pretty well all of the local authorities in Yorkshire that a One Yorkshire way forward is a good thing to look forward to," he said. A deal for the Sheffield City Region was agreed in 2015 and mayoral elections are due to take place in May at a cost of £1.9m, but the leaders of Barnsley and Doncaster Councils are among those supporting the 'One Yorkshire' bid. They have previously called for the forthcoming election to be postponed or for the mayoral term to be limited to two years. On receiving the 'One Yorkshire' proposal last month, the government said: "We have always said that we would welcome discussions on any widely supported proposal for a greater Yorkshire devolution deal provided the Sheffield City Region deal was not threatened and the proposal clearly relates to a sensible economic geography." Yorkshire devolution delays: What's going on?